Like to have a compact, light and easily built subwoofer? It’s not the sort of design that will shake your car to bits – its output is more in line with the factory subwoofers fitted to premium wagons and hatches – but it will add a distinct and real lower octave to many car sound systems. 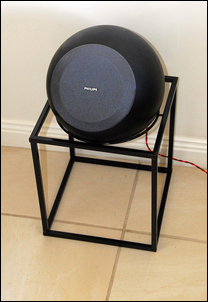 So what on earth is a subwoofer doing looking like a sphere? And how is an enclosure of this shape easy to build? This subwoofer enclosure design is easy to build because it’s based on two commercially available bowls that normally have plants put in them! That’s right: two flower pots! 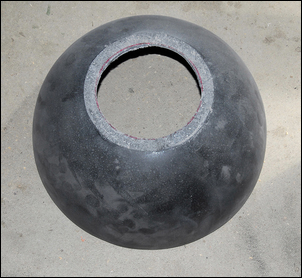 The pots are made from a new material – fibre-reinforced clay. This material is stiff, relatively light and acoustically dead. 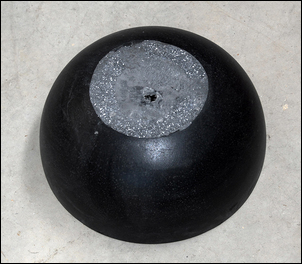 The pots are available in Australia in a range of sizes from the Bunnings hardware chain; in other countries, look for similar products at major garden and hardware suppliers. So how is the enclosure constructed? 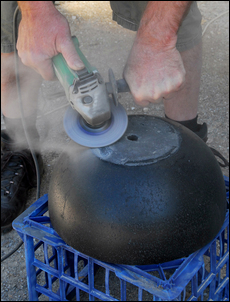 In short (more detail on the process in a moment) the flattened surfaces on which each bowl normally sits is ground smooth using an angle grinder. In one of these flats is cut the hole for the driver; in the other is cut the hole for the speaker port. The driver and port are installed in their respective bowls, then a layer of polyester wadding is placed inside the bowls. The bowls are then glued together using industrial adhesive. 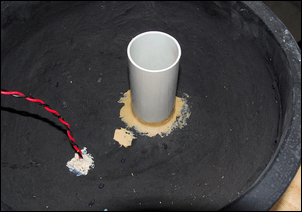 The result is a subwoofer enclosure that is very stiff (the curved walls flex little), and is shaped so that standing waves (internal reflections that normally occur off the flat walls of a speaker enclosure) are not present. The enclosure can also be very quick to build (under an hour, easily) and it does not require woodworking tools or machinery. These designs are based on smaller drivers that need to have a low Q – the one shown here uses a 5-inch driver that had a Qts of 0.55. 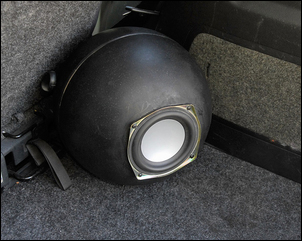 Also, depending on the interior arrangement of your car, the spherical shape may make fitting the subwoofer an easy task (eg mounted largely inside the dish of a spare wheel) or alternatively, it may be a more difficult task than fitting in a conventionally-shaped square enclosure. 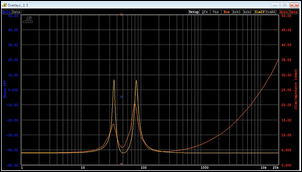 Finally, to develop a really good compact subwoofer using a small driver, you’ll need either the Thiele Small specs of the driver, or have a way of measuring those for yourself (eg by using Woofer Tester 2 - see The Breakthrough Technology of Woofer Tester). If you use a driver salvaged from a discarded speaker (as was done here), the total cost can be very low – especially considering the quality results. 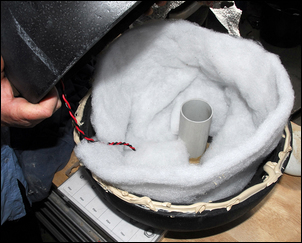 Note: The following step-by-step sequence shows a slightly larger spherical speaker enclosure being built. However, the process is identical to developing the compact subwoofer described above. Here is the as-bought bowl turned upside-down. 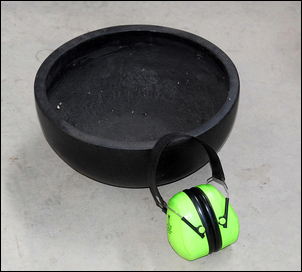 While it isn’t super clear in this pic, the bowl rests on ‘feet’ which are formed into the bowl. To gain a flat surface, these feet need to be ground off. A normal metal grinding disc mounted in an angle grinder does a good job of removing the ‘feet’. However, it’s a dusty job and so it’s best done outside with the operator wearing googles, hearing protection and a dust mask. Here’s the view with the base smoothed. To get it as flat as possible, follow-up the grinder with the use of a belt sander, or moderately coarse sandpaper and a sanding block. The next step is to mark the cut-out required for the driver. 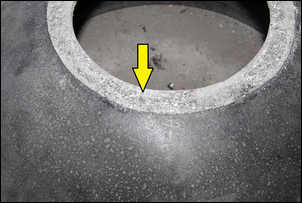 Be careful in sizing of this hole – too small and there will be the need for lots of further grinding; too large and you will not get the driver to seal in the hole. Note the pot drainage hole. 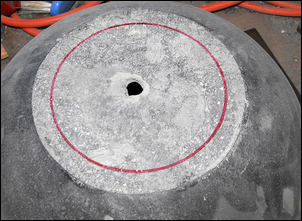 The hole for the driver can be cut out with an electric jigsaw – this pic shows the piece that’s been removed. Use a coarse wood-cutting blade – and expect to get only a few holes out of the blade before it is blunt. Don’t go like a bull in a china shop – you can crack the bowl if you push too hard. Here is the hole immediately after the jigsawing had been done. It’s difficult in the clay-fibre mix to follow the line accurately (there are small pebbles in the material too), so it’s better to err on the side of undersize rather than oversize. The hole can then be ground back to the line by carefully using the angle grinder. It’s hard to see, but the arrow points to one of the speaker mounting holes that has been drilled. 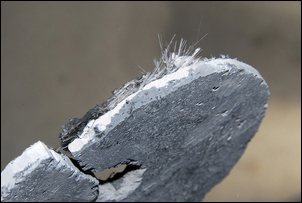 If you have a masonry drill bit, you could use that (but not with a hammer drill!) 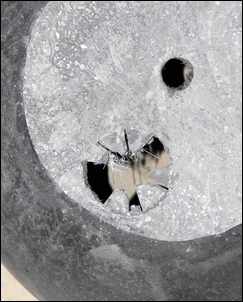 but these holes were drilled with a normal high speed steel bit. 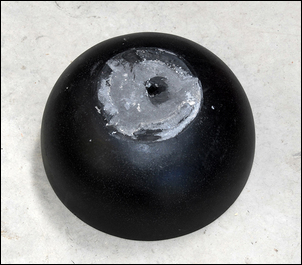 Drill the holes sufficiently large that machine screws can be inserted – nyloc nuts and washers will go on the inside of the bowl. 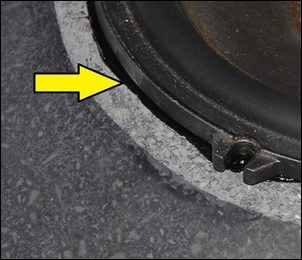 Use silicone sealant under the edge of the speaker frame. This is important because despite smoothing with the grinder and sandpaper, the mounting surface is likely to not be perfectly flat. You don’t want air leaks around the edge of the driver. The driver installed in the hole. 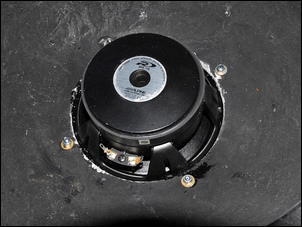 Note the use of washers and nyloc nuts on the speaker mounting screws. 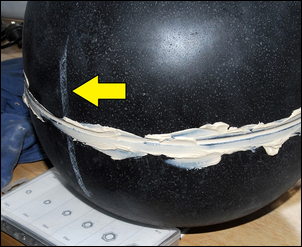 Tighten these when the sealant is yet to set – but be careful not to over-tighten or you could crack the bowl. If you want to mount a grille to protect the driver, and it needs to be bolted into place, do this step next. Any subwoofer mounting brackets should also be installed at this point. The port tube needs to be the correct diameter and length to match the enclosure design. 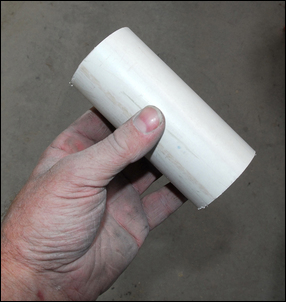 PVC pipe is cheap and easy. The port glued into place. For this task, and also gluing the bowl halves together, I used water clean-up Liquid Nails. 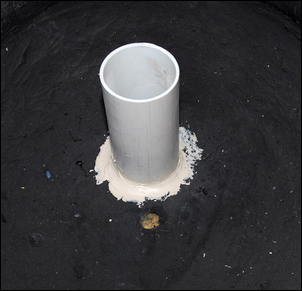 Note that this glue has also been used to seal the ‘water drainage hole’ provided in the original pot. 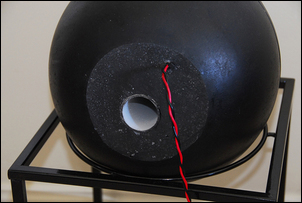 Now is also the time to feed the cable through a hole drilled in the bowl, and seal it with further glue. Either solder the wires to the woofer’s terminals or equip the cable with push-on terminals to make this connection. This photo actually shows two steps. The first is that polyester quilt wadding (available from dressmaking supply shops) has been placed around the inside of the lower bowl. Ensure that there is enough projecting upwards from the lower bowl so that when the two bowls are glued together, the wadding covers the inside surfaces of the upper bowl as well. Also ensure the rear of the driver and the port are not blocked by the wadding. The bowls are pushed together and then a wet finger used to smear the glue around the join, ensuring that the gap is completely filled. A damp cloth is then used to careful removed the surplus glue. (The glue must be of the water clean-up type!) Note the chalk witness line (arrowed) that shows the correct alignment of the bowls as they are joined. This line is made earlier when the best rotational fit is found – because their lips aren’t dead-flat, the bowls fit together better in some orientations than others. The finished subwoofer installed in rear of a small wagon. The grille has been removed for this pic. The enclosure was modelled as an 8 litre volume, tuned to 51Hz with a port 37mm in diameter and 130mm long. Once the subwoofer was built, Woofer Tester 2 was used to measure the actual impedance curve and compare it with the modelled prediction. As can be seen here, the two curves match well. 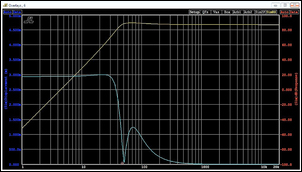 When tested with the frequency generator built into Woofer Tester 2 (and you can get cheap phone frequency generator apps that will do the same), the completed subwoofer shows smooth in-car response down to about 40Hz. Note that this is not a ‘one note bass’ subwoofer – lots of subs have a very peaky response around resonance and so all bass notes sound the same. Incidentally, in the real world, most door and dash speakers have little or no response below about 100Hz – getting down to 50Hz potentially adds an extra octave of response. This makes this sub an ideal add-on to a factory system. Obviously a spherical subwoofer is not for everyone! However, if a small and light sub is desired, and the Thiele Small specs of the selected driver are either available or can be measured, a very effective design can be quickly and easily built.